I am so psyched that gold flakes are mainstream now. I've been dying for gold flakes forever. 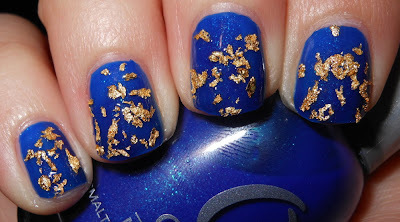 It's been kind of my dream to put together a blue with gold flake polish look. I absolutely drool over blue and gold together. It really is my favorite color combination out there. I got my hands on the Cult Nail gold flakes she has now and I made my polish dreams come true! Cult Nails Gold Flakes are well...gold flakes! The gold flakes come in a tiny little vial that is 1 inch in height. The amount you get looks very small, but fear not these go a long way. I barely made a dent in my bottle with what I have on my nails here. I had no method to my madness. I'm not a nail artist. I just poured a teeny tiny bit onto a piece of paper and dabbed them on with my finger onto semi-wet polish. Viola! It's probably not the most dainty way to apply these, but it worked. I love the look of these. They do not lay completely flat, and do have a bit of a 3D effect which is really cool. No worries, they stay on fine with layer of top coat. You know what I'm channeling here? Hearst Castle's Roman Pool with the cobalt blue tiles and gold. Heaven. Swoon. Polish perfection. I'm calling it a day! I got these on Cult Nail's site for $5.00. omg i looooove that pool. this is gorgeous. Generally I am not a fan of yellow gold, though I do like the textures this creates! Ahhh, I have not been to Hearst Castle in forever. I need to rectify that! It was much easier to go when I lived nearby! Mmm, gorgeous! I'm pretty psyched about the gold flake trend, too. Can't wait to try something similar, maybe over a deep purple, or cobalt as you have here. Looks amazing! OMG I didn't know Cult has gold flakes now! They look fab over Royal Navy, one of my favorite blues ever. Hmm, I'm not too sure about Gold Flakies... but that blue - now that I am sure about! LOL - It's called the Neptune Pool - not Roman Pool - the pool was based on Roman baths. I worked as a tour guide at Hearst Castle for a # of yrs. Still live close by there. Not sure I like this Cult topper - like the idea but would not like it if it is leaving raised lumpy things across the nail. Love that Orly shade as to many - it has it's own 'cult' following! For a less 3D effect, I like the gold leaf polish that Sephora by OPI has out, and that OPI has coming out in one of their upcoming collections (can't remember which one), but they are $30...a bit too pricey for me. Oh I remember now, it's in the OPI James Bond 007 collection. Such a great combo! I love blue and gold as well. You just helped me plan my outfit for tomorrow. Oooooh! Looks like underwater treasure! Beautiful!